Game Chef (@game_chef) is an annual Game Design Competition which started running in 2002. Entrants have 9 days to use at least two of four ingredients to create a game around a given theme. This year the theme was A Different Audience, and the ingredients were abandon, dragonfly, stillness and dream. I was particularly taken with the ingredients abandon and dream and at looking to find a way that different players of the game could be considered different audiences. The answer to this was to have some of the players fight over narrative control for the game, attempting to meet specific moods. I was also interested with heightening the experience for at least one of the players. I have often found when I play story or role-play games I often close my eyes to imagine in detail my surrounding and what is happening. By forcing one of the players to wear a blindfold and have the other players describing the world to them, that player could potentially have a much richer experience. Bringing these ideas together after some helpful discussions with Adam (@adtidixon) and Sean (@seanFsmith) I finally settled on the mechanics and theme for the game. Somewhere between here and there lies the Dwolma, a dream world filled with abandoned souls seeking their escape. Blind to the incomprehensible world around them the Abandoned have little hope. A few of the first to be lost in Dwolma have found ways to understand and manipulate the world around them, they are known as Ushers. As the Ushers are cursed to be trapped in Dwolma forever, they seek pleasure in playing with the souls of the newly abandoned. Ushers will often play Bēodan, a bidding game, and make wagers with each other, attempting to elicit moods from any Abandoned that they find. Appearing to act as guides they will attempt to influence the Abandoned’s mood to create a story to their individual taste, each Usher a different audience to the Abandoned’s misfortune. The full rules are available as pdf here. 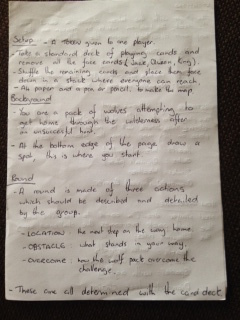 This entry was posted in Practice, RPG and tagged competition, dwolma, Game Chef on June 23, 2015 by davidpeterking. A narrative role play game where the players each take the role of a character who has witnessed the actions of a masked vigilante. After a year of the masked vigilante’s actions the group have gathered together to discuss what they have witnessed. Once their discussion ends they will determine if the vigilante is a criminal to be stopped or a boon to a corrupt society. However, one of the members of the group is the vigilante in his everyday guise and one of the members has already made up their mind about this scourge. • A Standard 52 Deck of Playing Cards. • A couple of hours. 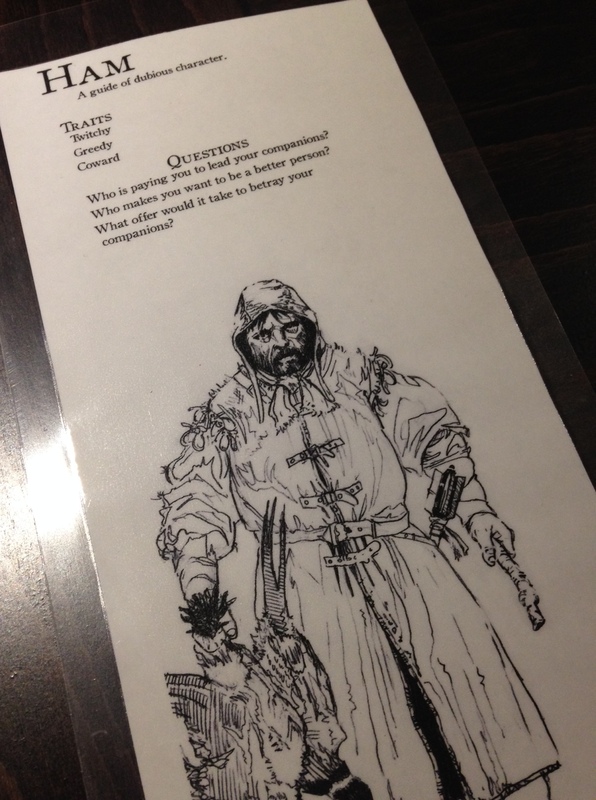 Each player should select, read and complete one character sheet. Narrative Deck: All cards from Ace – 10 in each suit. Hidden Roles Deck: King of Clubs, King of Hearts, any two Jacks. Shuffle the narrative deck and place it where everyone can reach it. Shuffle the hidden roles deck and give each player a card which they keep secret. King of Clubs – Vigilante: Wants to goes free. King of Hearts – Opposition: Wants the vigilante captured. Either Jack – Citizen: Wins if in majority after vote. Shuffle the season deck, turn over the top card, this is the starting season. Place the other cards from the season deck in order under it so the corner of each card is visible. The suit of the current season is classed as a trump suit which is always higher than other suits. In cases where cards have the same numerical value, their ranking is determined by which season will occur first. The prologue helps the players set the scene for their story. Each player will add details and help shape the environment in which their characters and the masked vigilante live. Each player should draw five cards from the narrative deck. Each player plays a card face down in front of them. All cards are revealed at once, the player with the highest value card gets to determine the next detail in the list. Once a player has determined a detail they no longer reveal their card. In which decade, from 1900 to the present, is the game narrative set? Describe a little about that decade to the other players. Each other player may then add a small detail about the decade, going clockwise from the winning player. Where in the world is the game narrative set? Describe the location in more detail. Each player may then add a small additional detail, going clockwise from the winning player. What started the vigilante on their journey to becoming a vigilante? Describe this in detail. Each player may then add a small addition detail, going clockwise from the winning player. What is the name the citizens of the location have given to the vigilante? Describe what the vigilante wears. Each player can add a small additional detail, going clockwise from the winning player. The main narrative of the game takes place over a year. This is the first year in which the masked vigilante becomes active. The players should use the seasons to help give their characters’ witness accounts more flavour. Only three seasons are covered in this part of the game, each represented by a single round. Every player will have an opportunity to contribute to the narrative arc of the masked vigilante in each season. At the beginning of each round. If this is not the first round take the top card from the season deck and place it at the bottom so that the corner of the card is still visible. Each player should draw cards until they have a hand of five cards. Each player should play a single card face down. Reveal all the cards at the same time. The player with the highest card takes their turn last, the player to their left has their turn first. The current season is the trump suit. For each turn the current player should take the following steps. The current player should draw three additional card from the narrative deck. The current player should describe an event involving the masked vigilante as witnessed by their character. The event should involve greater consequences that previous event. The player should also take into consideration the current season when describing the event. The other players, starting with the player to the left of the current player, each of the other players should ask the current player a question in one of two forms. The questioner should pose a question about the action of the masked vigilante which could be answered simply with yes or no. They should also play one card from their hand face up on the table. If the witness wishes to answer yes they must play a higher card, if they wish to answer no they must play a lower card. The witness should embellish on the event considering the new detail found. Alternatively the questioner can pose a personal question to the witness about how they felt or what they did. Both the questioner and the witness should discard a card. The epilogue takes place during the final season of the masked vigilante’s first year. Here the players will determine what is the outcome for the vigilante, will he be unmasked and imprisoned or will he be left free to do as he pleases. Change to the Final Season. Take the top card from the season deck and place it at the bottom so that the corner of the card is still visible. The player with the opposition card (King of Hearts), should reveal themselves to the rest of the group. They should attempt to identify the vigilante amongst the group. The player they select should reveal their hidden role card to determine if the opposition was correct or not. If the masked vigilante has been identified they should not take part in determining their fate, but they should keep their remaining card for the final part of the game. Each remaining player should reveal their final card. Total the red suited cards and compare them to the total value of the black suited cards. If the red value is greater then the vigilante will be found to be boon to society free to act as they please. If the black value is greater then the vigilante will be captured for disobeying the laws that everyone else has to conform too. Starting with the player with highest value card of the losing red/black total and through the lowest back up the highest of the winning red/black total each player should describe an event. This event should be one that occurs directly between their character and the vigilante. If the player is the vigilante they can describe an internal monologue or narrate a scene. 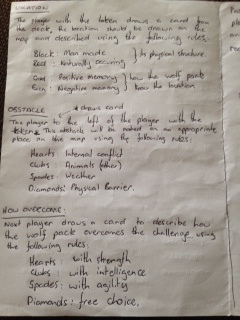 Players should lead towards the outcome determined by the cards. This entry was posted in Practice, RPG and tagged design, Masked Vigilante Year One on January 10, 2015 by davidpeterking.